Hmm, what do you do when you have too many bananas? 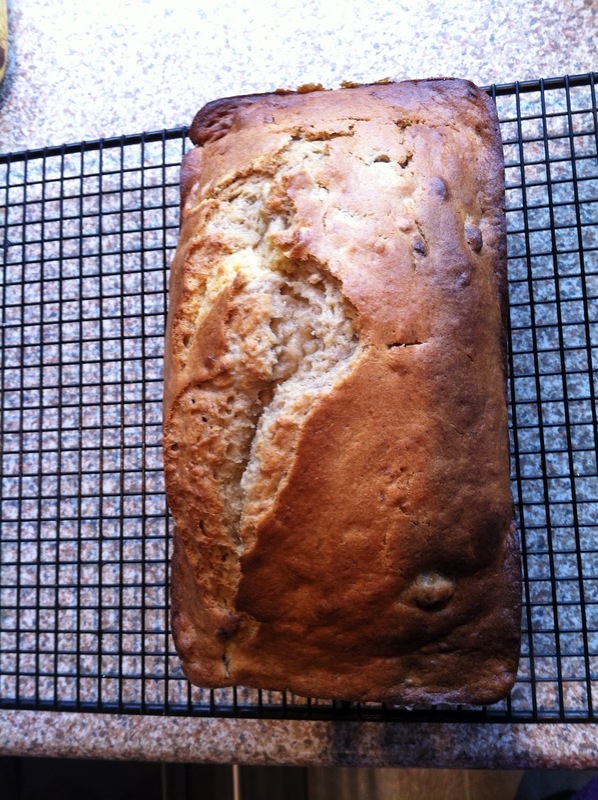 After dropping loads of “hints”, I decided to make my hubby some banana bread. It’s just cooling in the window and looks lush! Preheat oven to 160°C fan assisted. Sift the dry ingredients together and combine with butter mixture. Blend well. Add the bananas, sour cream, and vanilla and stir well. Bake approximately 45 minutes depending on your oven. The original recipe says bake for 1 hour, however in my fan assisted oven if I did that it would be burnt to a crisp! I usually bake for about 25-30 minutes and then see how much longer it needs. It is done when a tester in the middle comes out fairly clean. « Argh, life keeps getting in they way!